While we can certainly appreciate the engineering that goes on in a huge Champagne house that can produce millions of bottles a year and make it all taste the same, that’s not what we’re looking for in a glass of bubbly. We’re more interested in vineyard selections and old vine cuvées that speak of place and the particular aesthetics of the producer. This holiday season you’re not going to find sizable end caps of yellow label stuff at Elie Wine (frankly, we have too many good bottles stocked to make room for that kind of wine). What you will find is an elaborate selection of small-production Champagnes, primarily Premier and Grand Cru, and from small producers to individual growers who are deeply connected to the particularities of each of their vineyards, and that vinify each vintage carefully in the search for balance. We’ve always advocated drinking Champagne for more than just special occasions, and we still do, but we also know that this is the time of year when folks like to go all out. Whether it is for a gift, to pair with an elaborate meal, to ring in the New Year, or to christen the yacht that Santa left under the tree, we’ll have you covered. Stop by the shop this Saturday to sample from three specially priced grower Champagnes and browse the rest of our inventory for your holiday bubbly needs. A blend of 80% Pinot Meunier, 15% Chardonnay, and 5% Pinot Noir from third-generation vintners. The vineyards are located about 4 miles outside Epernay in a little-known area tucked away between the Vallée de la Marne and La Côte des Blancs called Les Coteaux Sud d’Epernay. Aged at least 3 years in the Didier-Ducos cellars. 100% Pinot Meunier from about 18 acres of parcels spread over the old lands of Mesnil-le-Huttier, Leuvrigny and Festigny, all located in the heart of the Marne Vallée. 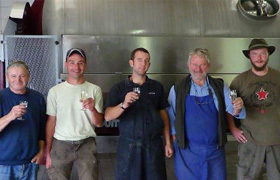 A true Champagne produced using traditional practices and the knowledge of Maryse, Gérard, and their son Florent. Martine and Pascal Serveaux, helped by their children, raise this blend of 65% Pinot Meunier and 35% Pinot Noir from 29 acres of vines located in the central Marne Vallée.